Buff Club Car Precedent (2004-UP) Golf Cart 'Classic' Rear Flip Back Seat Kit. 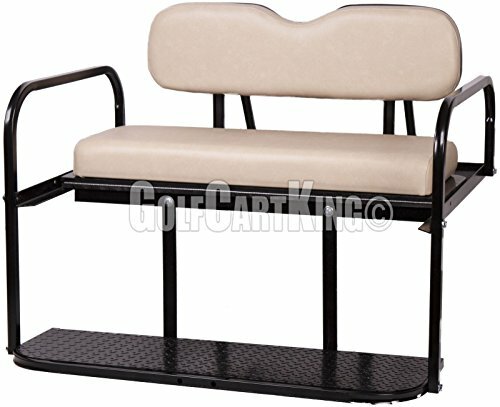 This Rear Flip seat fits Club Car Precedent models (2004-Up) Golf Carts. Cut-and-Sewn Marine Grade Vinyl (this seat does NOT include an embossed OEM pattern). Does NOT have a 360 degree bed rail around the cargo deck to secure cargo. Durable High Density Polyethylene plated cargo deck. The ability to support an excessive amount of weight. Pull handle for easy opening/closing of the cargo bed. Simple bolt-on design - no cutting or welding required. More seating room and a higher back rest for passenger comfort.